I would like to tell my story, as the Eighth Amendment referendum campaign has brought everything back to me. My husband and I were thrilled when we discovered I was pregnant, with our first child. The usual excitement and morning sickness etc.. was not just for the first three months, but much, much, longer, and as I thought that this was all quite normal, I did not worry. Our child was born three days after our 1st wedding anniversary. Not hearing the child cry at the delivery, I realised that something was wrong. I asked the gynaecologist if there was a problem, and he said the he would talk to me when he had finished suturing me up. I had been given three sleeping pills and an injection, the night before the delivery, to sedate me, as the doctors knew what was coming, but I did not. What the injection was, I don’t know, but been a nurse myself, I decided that three pills, were too many and decided to take only 2 tablets, so I was heavily sedated, but still conscious, when baby was born. Back in my room, the Night Nurse, who couldn’t have been more kind and compassionate, told me that I had had an anencephalic baby. Never having studied midwifery, I did not know what that meant. She explained that it was a child born without a brain, head not fully developed, 10 fingers and 10 toes etc.. but no head. Because of not having any brain development, the child could not live, outside the womb. But our child lived for 10 minutes, and was baptised. When I requested to see the child, at delivery, I was told that it would be better, if I didn’t. Luckily, my husband was present, and he did see Catherine Anne, whom we named after, my sister and one of the Nurses present at the birth. But, I never saw, or held, our first child. The pain of not seeing, or holding that child, still remains with me, to this day. The hospital concerned, in their wisdom, and probably out of kindness, offered to have the child buried, with one of the geriatric patients, who had died that day, and so save us the grief of having to arrange for a burial. It took many, many, visits to that maternity hospital, and many searches through records, and many visits to various graveyards, throughout our district, to find where my child, was buried. It was some 30 years later, having gone through the ‘Freedom of Information’ route, that we found the probable resting place of our first child. And so we have a small plaque, as a gravestone was not allowed, due to the fact that there could be more than one other person buried in that grave. But we can, and do go, some 41 years later, and visit that grave. I want to appeal to all people, and particularly those who are still undecided, to vote no in the coming referendum. In an abortion, a life is terminated. But please remember that there are many people, who cannot have children, who would be only delighted to either adopt, or foster a child. In this modern world, where we are all striving for perfection, we should remember, that nobody in this world, is perfect. We all have our own individual imperfections, our defects. Thank you for taking the time to read this, but as a 74-year-old mother, with 5 wonderful children, and 7 grand children, I feel so, so strongly, that it is necessary to vote No in the coming referendum, and to keep the 8th Amendment in our constitution. Maeve is not a member of any pro-life group and is writing in a personal capacity. Posted in Misc and tagged The Eighth Amendment at 10:48 am on May 23, 2018 by Admin. power move with such articulation, you win. but you trusthe politicians of 1983? And the bishops, let’s not forget them. Not that I want to bash the bishops or anything but they were very interfering royalty back then. That’s such a copout, grow a pair! According to UNICEF, there are 153 million orphans worldwide. excellent point rach, and one that does not get enough airtime or traction. But Maeve, that is how YOU feel. Other people might feel differently, can’t you accept that? Why do you want to impose what YOU feel on to others? Vote Yes! Vote Yes Maeve, do not deny women control of what happens do them either conscious or not; in the way you were denied control of what happened to you. How is Maeve imposing her views? She merely asked. And are you not imposing your views by saying vote yes?? Every Yes vote supports every abortion that will happen in Ireland. @Andrew just pointed out to you every NO vote signals an absolute distrust of women to make the right choice for themselves. you get to choose what to do with your body @newsjustin, it seems you would like me to also place my wife’s rights into your hands. are you serious? its a rhetorical question, because I know that’s EXACTLY what you would like, no need to answer. No Listrade. That’s faulty logic. Good! Thats the point. Women have been treated appallingly in Ireland for too long. They deserve the same rights and healthcare as the rest of Europe. I think the European comparison should make some people stop and think. 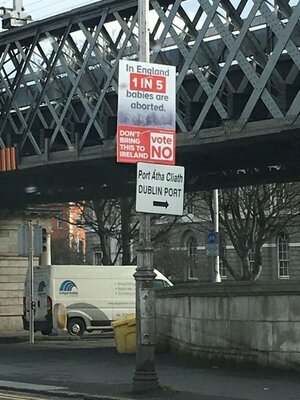 What has got lost in this debate is how extreme the 8th amendment actually is. Adoption is not an alternative to abortion, it’s an alternative to parenthood. Don’t force me to carry a child, permanently physically alter my physiology and have to answer all of the questions along the way (“oh when are you expecting? you must be so excited” followed by “why are you giving up your child?! I could never do that”). There are millions of orphans in the world, plenty to go around for those who can’t conceive and want a child, or those who can conceive but want to adopt anyway. Not allowing a woman to see her own baby? Not telling her beforehand that the baby was FFA? Sneakily sedating her so she wouldn’t be aware? All choices denied to the woman, all signs of the influence of the 8th. Please vote Yes. This is what I got from that piece. This poor woman (and much of her generation) had very low expectations of maternity care, and was fine with being kept in the dark. Times have changed. People expect more, women deserve better. So sorry for your loss, but with respect, I should not be forced to carry a pregnancy I cant carry. Also, I don’t feel I should be responsible for supplying others with children. Well said Maeve. Abortion is the deliberate taking of human life. Voting for it, except in very grave circumstances, is a flagrant injustice to our fellow humans. Forcing a raped woman to complete a pregnancy against her will is a flagrant injustice to a real sentient human. For me, a 4-week-old foetus isn’t a “fellow human”. its a 74 year old mother, writing her story and sharing her opinion, which she’s fully entitled too, and most likely reading this,no need harangue her. he’s pointing out @newsjustin’s logic is narrow & in my own opinion seriously flawed. unless you’d prefer to live on planet justin & follow his preachings that is. I think Cian is respectfully disagreeing with Newsjustin, who respectfully disagrees with him, and they are both being respectful of Maeve, who bravely offered up her story as part of the debate. If more of the debate was like this we’d be doing quite well, thank you. I thought the same, Johnny, well said. @johnny, this wasn’t haranguing Maeve. She shared her sad story. I was replying to newsjustin. No but absolutely awful way she was treated most definitely is. What about FFA (as she had) is not a very grave circumstance? Again with the deflections. Nobody is voting *for* abortion, they are voting to remove an amendment, a faulty one at that, that was introduced into our constitution. People who are voting Yes are doing so for choice, for compassion and for respect of a woman’s right to decide what she feels is best. 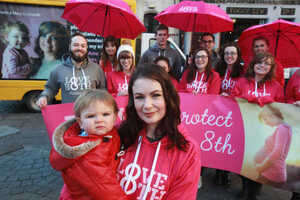 If, for whatever reason, she feels that she wants to terminate the pregnancy, she can do so in a safe and controlled environment here in Ireland. What might happen with legislation down the road is the domain of politicians and can be enacted or repealed much more swiftly than a constitutional amendment. I have yet to meet someone who is voting *for* abortion, but do keep on, at the very least its a good look at the mentality of the No campaign. In relation to the article, I feel for you Maeve, I really do and unlike people like Ronan Mullen, I don’t feel the need to belittle your experience because it runs contrary to how I shall be voting. I don’t feel the need to snigger or condescend to you, because you have had a tragic experience and I sympathize. But please, try to understand that this is not about trying to kill babies, its about allowing women the choice, a choice you had taken away from you by a tragic twist of fate, to decide what they want. I imagine you are firm in your views and I respect that, but I differ, but respectfully so. It is a very well written article, you may have missed your calling if writing is not what you have done until now as well! 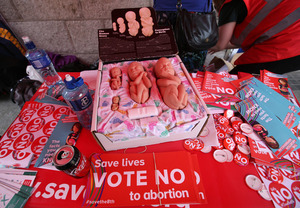 How strange that these people do not realise that a Yes vote would still keep the option to not abort. It is as if a Yes vote will suddenly see no birth at all – mass killing for all. I am at a loss for words on the thought process in those people heads, no matter how sad this story is once again it is in no way a good argument for a No vote. If its compassion they are talking about and understanding then Yes is the only answer not restrictive in this corner stone issue of abortion rights. It will see no birth for every single human that is aborted. Your argument seems to be that some babies will still be born, so what’s the problem? The problem Is, individual human beings, the subject of individual choices for abortion, will be individually killed. Society will have choice, and we’ll pat ourselves on the back for it, but individual human beings will have their lives ended. It’s really nice for you that as you have no possibility of personally being pregnant that you can be so absolute. Must be kind of a relief. Justin – please do follow through on the conviction of your anti-abortion beliefs. Please start arresting pregnant women leaving Dublin Airport flying either to England or to Holland on the off-chance that they might be going there for abortions. You anti-choicers are ok with abortions happening in England for Irish women but not here. You do not fully follow through with your convictions. Why not find a woman who has had a baby aborted and impose a 14 year jail sentence on her??? Because you know that the majority of Irish people would not stand for it. I will never understand why you lot make it your life goal to fight the tide. Change is coming. It is progressive and it cannot be stopped. Yet you and LoveBoats, Breda O’Brien, John Waters, Davy Quinn and the Iona Institute etc. etc. will never stop fighting that tide as it laps onto our shores. Such a futile waste of energy yet you expend it – it’s fascinating really. The true measure of any person’s commitment to human rights according to Pluto – willingness to go along with the tide. Justin, it’s none of your business. If you are so interested in the dignity of life, how come you spend your time here, instead of out on the streets helping the drug addicted and homeless? Tycho, next you’ll be telling me how pro-life people only care about people until they’re born and then stop caring. I won’t, I’ll just put the question to you again, maybe you’ll answer this time? But there we are again. I am going to say it Justin – the only ‘human rights’ you care about are those in the womb. If this referendum passes on Friday, which please dear fupp it will, will you be out at every maternity hospital until your last breath trying to stop every single abortion in Ireland from happening ever? No of course you won’t. Serious question: Did the obstetrician arguing the No case last night not say that he proceeds with terminations sometimes even when there is a heartbeat? Dr Trevor Hayes, a consultant obstetrician from Kilkenny. You can view it on the RTE player. He says it from around 6:15. So here we have a doctor, on national television, arguing to retain the 8th while also stating that he performs abortions while a heart is still beating. I am not blaming for doing so but is he asking other obstetricians to also break the law just to save the 8th? That is legal within the parameters of the 8th and the PLDPA 2013 as long there is a real and substantial risk of loss of the woman’s life from a physical illness AND that risk can only be averted by carrying out an abortion. So if she has sepsis and will die without treatment, an abortion is okay. SOQ- that’s not breaking the law!! If you think it is then you have failed to understand abortion law in Ireland. Doctors were never and have never been prevented from treating a woman whose life is at real risk. The foetal heartbeat is not a barrier to a doctor acting to save the life of the mother. I thought this was we’ll understood, obviously I was wrong. 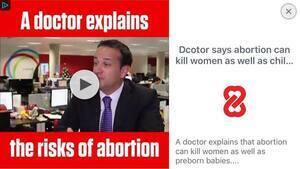 That doctor (from Kilkenny if I remember rightly), was explaining how he protects the life of women even if it means the unfortunate death of an unborn baby. He’s acting entirely appropriately and within the law. Frankly, misinformation like this SOQ is very unhelpful and misleading for pregnant women. So we are back to the same question then, what is ‘real risk’? Death’s door? Just wondering, how many women have actually died in such circumstances? Is there any stats? Likewise, how many women’s health was damaged by lack of healthcare or do they all just go to England? the difficulty (as I see it) is where the foetus has a heartbeat, but the woman’s life isn’t in danger – i.e. life Savita when she presented into hospital. The foetus will not survive, the woman isn’t *currently* in danger, but if she is left alone there is a chance that she will get sepsis – which could kill her. In that window of time where the foetus is alive, but she doesn’t have sepsis – can a doctor legally perform an abortion? Using the Supreme Court interpretation it is serious and imminent. The report into the Savita cases quoted the doctor as saying that at that point sepsis was a theoretical risk. It was likely and probable, but not actual. But under the PLDPA it requires two opinions (?) so if both agreed then maybe it would be legal? Dunno. Way too grey an area. Which would be the whole point. The doctors differ and the patient dies. Last night we had two doctors arguing very different things. They can’t both be right? They should and do know in advance which patient is at high risk of arriving at death’s door before they can act. There is no flag which goes up to indicate so it is up to interpretation, or from the patient’s perspective, luck. Now anyone who believes in retain please come back and tell me what where I am wrong in this logic? Essentialism failed with Darwin, quit pretending otherwise. Even if you had been told of your baby’s condition and abortion was available at the time, no one would force you to terminate your pregnancy. It should be your choice to continue with your pregnancy or not. If the Yes vote is passed there will still be women making the choice to continue to term. As is their right. A child with an FFA can’t be adopted or fostered. So sorry for the loss of your daughter Maeve, awful experience to go through. My partner and I have gone through a similar tragedy. We are voting No but not just because of our losses, because we believe life begins at conception. Vote No. Why do you believe ‘life begins at conception’? If you’re being literal, that’s not just demonstrably false, it’s utter nonsense. If you’re not being literal what DO you mean? I know it sounds like I’m being pedantic but there are proper risks to putting things on poles carrying live. Very sorry for your loss Maeve, and indeed it is awful that there was a cover-up by the hospital. You were denied control of your labour, your birthing experience and to see your own child. But your point at the end about adoption does not hold any weight to the rest of your story. Adoption is not an alternative to abortion and no one ever should have to sacrifice their well-being to be a service to those who are infertile. So hand back control to those who are pregnant and vote yes. If you please. In the event of Repeal, Maeve, no one would force you to have an abortion if you wanted to bring your pregnancy to full term. Can you not respect the rights, needs and circumstances of other women to make decisions that differ from your own? While I sympathise with Maeve on her experience, especially the way in which she was treated, I don’t see the relevance to this referendum. The only similarity is that she had no say in her pregnancy which is exactly what a Yes vote will help change. A very interesting read. Thank you for sharing Maeve. I’m so sorry for your loss, and for how you were treated. I can’t imagine how awful it was to have buried the child you carried without ever getting to hold her. However, I do agree with many of the other commenters here, and think that should the referendum pass, it will not infringe on your, or anyone else’s, rights to carry their baby to term, even with a diagnosis of FFA. All it will allow is women the freedom to choose the best path for them. It will also allow the ending of a human life Mildred. Lets not forget that. But, as you well know after our many, many debates on the subject, that I believe that a woman’s right to choose supercedes that of a 9 week old foetus. I won’t deny that a life, or a potential one, is taken; I won’t deny that a pregnancy is ended. But I won’t stand in the way of another woman’s choice – not in something of this magnitude, something as life altering as this. The ending of a human life is already allowed. We are allowed to travel with the sole purpose being to end a human life. What is not allowed now, is for it to happen in our own hospitals where people can be treated with dignity and respect. I am lucky I had two healthy pregnancies. If I had ever had to contend with an FFA or if either of my two beautiful daughters ever has to, I want the treatment to be at home where I/my daughters can be around family for all the support they need in this awful time. I want them to be able to bury their baby with dignity and not have to bring them home in a jiffy bag or a cool box. will you feel lonely when all this is over on Friday? Very very sorry for her loss and it does sound like she wasn’t treated the best but with all due respect, what has this story got to do with the referendum. Given the timeline it surely would have occurred pre-1983? If anything this story has made me even more certain that a Yes vote is the correct vote. Poor Maeve had all of the decisions during her pregnancy and birth taken away from her. The hospital decided for her that she shouldn’t know the truth about her pregnancy. Instead of giving her the choice to hold and see her child as she wanted and the time to decide on what kind of burial she wanted for her daughter and to process what was happening she was sedated and had to spend years finding out where her baby was buried and she is only allowed a plaque at the place. What an awful story. The poor woman. As heartbreaking as this story is I don’t understand how a No vote would stop things like this happening. If the Yes vote wins on Friday mothers can still choose to carry their foetus to full term even if it has been diagnosed as having something like Anencephaly. While Maeve’s story is obviously gut-wrenchingly sad it’s very much her story and a YES or NO vote will not deny a mother the right to see her pregnancy through to the end. However, a YES vote will give a mother like Maeve more options, not less. A NO vote will force her to carry the foetus to full terms even though it lacks a brain (and one can therefore argue that after birth there will be no sentience whatsoever). Is it not disingenuous to posit these kinds of personal tragedies as a good reason to vote no? Especially as one commentator pointed out that given her age this would have happened before the 8th was even inserted into the constitution.. There are so many personal tragedies being used to push a yes vote. It’s good to see some balance. This story is heartbreaking, and I am not surprised the terrible pain has stayed with this woman all this time. But it is really quite striking that every single stage of the trauma done to her was done by others (doctors) who disrespected her so much they took away all of her choices: not telling her about the FFA, drugging her to spare themselves, presumably, her distress, leaving it to the (less well paid) night nurse to break the truth to her, not giving her details of the burial. Meave, can you not see this? They did not allow you to have any control. They showed very little compassion towards you, from what you say here. The Repeal movement is opposed to precisely this. A Yes in the referendum won’t mean compulsory abortions; it will mean dignified health care for those who need abortions, and an end to the kind of stigma which allowed doctors to treat women like this for so long. I don’t wish to diminish in any way the impact of the loss of her daughter had on Maeve, but, where to start? Firstly, it doesn’t seem to bother Maeve that the truth of her (and her baby’s condition was with-held from a grown woman – and a Nurse – according to this post. The medical profession, and her husband presumably, treated her like a small child. Other, more articulate posters than me, have already pointed out the millions of babies and small children who are crying out for the protection of a family… my last word – I personally know four women who have had abortions for various reasons. None of them expressed regret, only relief. I also know two women who, as young girls, were strongarmed into giving up their babies to the Nuns (who presumably received a healthy profit). Both of these women eventually married and had families, but the wound and the loss is still with them. Like myself, they are in their late sixties, but still cherish those lost babies. She wants us to vote no because she was forced to carry a unviable baby to term, and others can’t have babies? I’d love to know how Maeve voted in the end. I hope the comments here gave her pause for thought.